Sometimes we want to dry our hair as quickly as possible and get on to the next thing. But after washing your hair, it’s time to exercise patience; wet hair is vulnerable to damage. Here’s how to best care for your hair when it’s wet. Most women have used towels for drying their hair, or to wrap hair up into a towel turban. But beware. Since hair is more susceptible to breaking when wet, winding your hair up in a heavy towel can inflict damage. Towel turbans are often the cause of spit ends, broken ends, and terrible tangles. Instead, use a towel to delicately pat dry your hair, blotting out water without squeezing, wringing or twisting. While your hair is wet is a great time to detangle. After towel blotting or letting hair partially air-dry, add your favorite detangling product. This might be an anti-frizz serum, a leave-in conditioner or light hair oil. Your hair will absorb products best once it’s partially dry. Use your fingers to distribute the product through your hair. 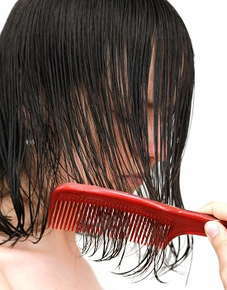 Then slowly pull a wide-tooth comb from your roots to your ends until your hair is knot-free. If you’re planning to blow dry your hair, consider adding a heat protectant spray made with argan, castor or sunflower seed oil. This will keep your hair safer from the negative effects of heat styling. Make sure you’re using the right products on wet hair. Hair gels, waxes and thick pastes will assist you for some styles, but these are all intended for use on dry hair. Habitually wearing your hair in a ponytail can lead to breakage, even when your hair is thoroughly dry. But when your hair is wet and vulnerable, pulling your hair back tightly becomes a major no-no. Buns and ponytails need to wait until after hair is dry. Especially beware rubber bands, which have a terrible effect on wet hair. If you need to get that hair out of your face, or you’re ready to start drying it, use professional-grade styling clips. These curved clips fit the contours of your head. Visit your local beauty supply, or buy a few online. Next time you come in for an appointment, we’d love to talk about your wet hair and styling concerns. Our expert stylists are always happy to answer your questions and have long discussions about hair. Give us a call today.